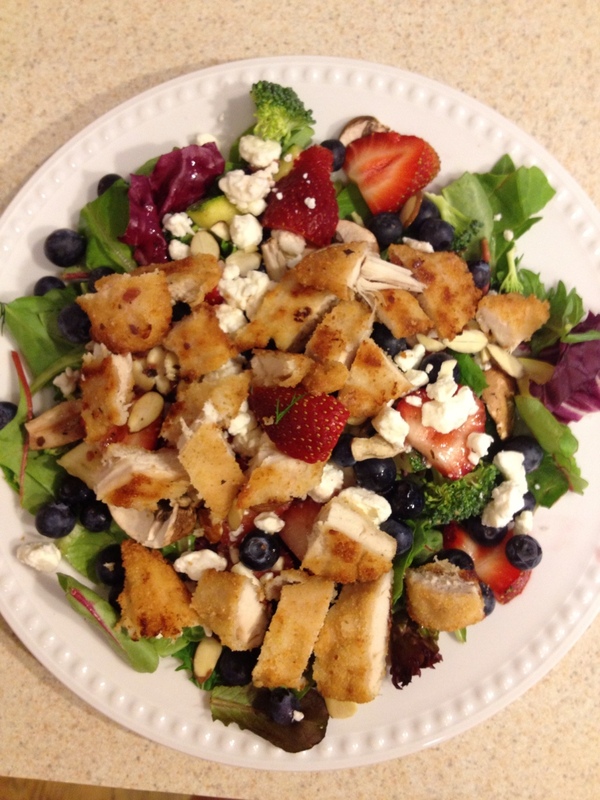 Gotta Love Summer Salads | Who's Cooking for Kacey? Some meals are so easy, even I can’t screw them up. Summer is made for non-cookers like me. All you need are the right ingredients and a knife, and you, too, can eat this good. Now this is a recipe I can deliver without Danny’s help. 1. Bake gluten-free, air-chilled chicken strips for 27 minutes. No need to even flip half-way through! 2. Open containers of Whole Foods pre-chopped veggies and organic spring salad mix. 3. Wash berries. Slice strawberries until bite size. 4. Add almond slivers and feta. 6. Add your favorite salad dressing. Summer produce makes it easy to eat fresh, wholesome, raw foods. No real cooking necessary. Now this is a salad you could proudly serve to someone else. It’s no Danny’s Kitchen, but it’s fresh and tasty and worth every calorie. Where did you buy the chicken at?